Have you wondered where is the best place to buy a HDB resale flat in Singapore considering your budget or the remaining lease left in different towns in Singapore? 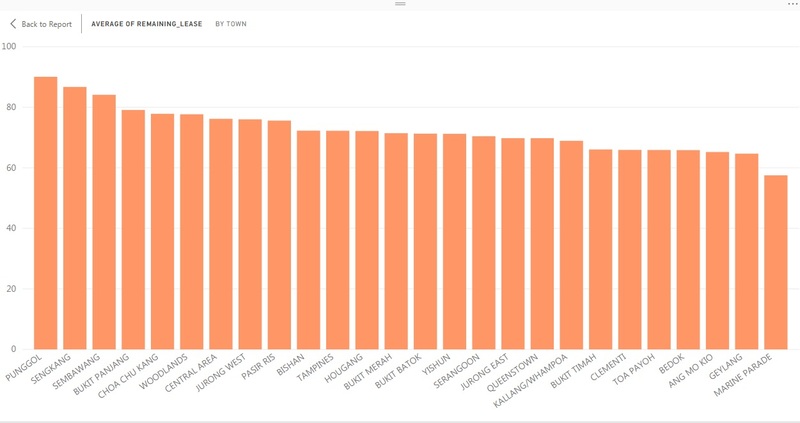 I've been exploring data analysis through visualisation and did up a dashboard of the various resale prices in different towns in Singapore. 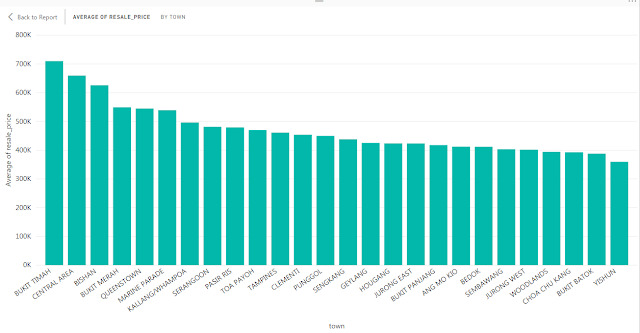 This is done using the data on data.gov.sg. It is often hard to find all the information we need as its all over the place even when we have Google search. With visualisation, we can see the data at one glance. 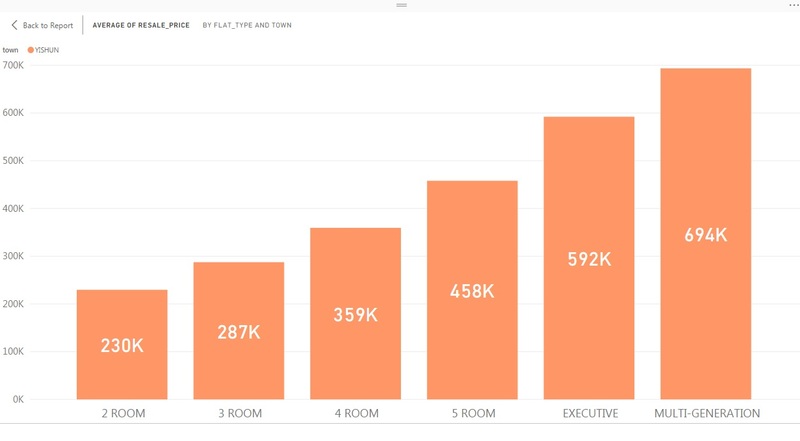 The visualisation software I am using for this post is called Microsoft Power BI which I've been learning and using for my work as well. The average HDB resale prices below are based on the sale transactions from 2015 to 2018 February. It may be too small to view on my blog so you can click on the image to have a better view. I've set the diverging colour to be green for the lowest prices, amber for mid range prices and red for the highest prices. Do take note again that the prices above are based on the resale sale transaction prices from 2015 to 2018 February for all room types so if a town has more 2 room or 3 room flats as compared to 4 room or larger flats, then the average price will be lower. When buying a HDB, we may also consider how old is the estate as the remaining lease does have an impact on the prices of the HDB as well. From the bar chart below, we would be able to see that the newest towns with still quite a lot of lease remaining is Punggol and Sengkang while the oldest towns seems to be Marine Parade and Geylang. This is probably due to the fact that Marine Parade and Geylang doesn't really have much new flats being built there so the town's average remaining lease is much lower as compared to other towns. 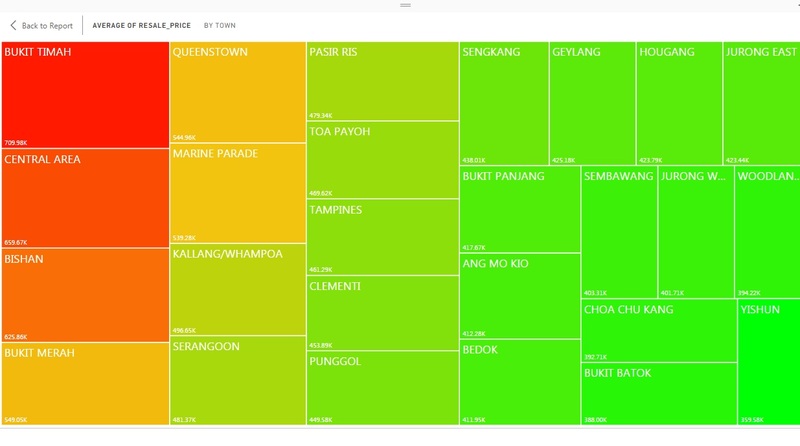 However, Geylang town had some good new BTOs being launched there just a few months ago in Eunos and Ubi which could change this in the future. To confirm if remaining lease has an impact on HDB resale prices, I also did a visualisation to sort the HDB resale prices by its remaining lease. Yes, it does seem the general trend is that the lower the lease remaining, the resale price of HDB is lower as well. From previous analysis, we see that Yishun has the lowest HDB resale price among all other towns. Let's take a deeper look at Yishun. Yes it seems like Yishun is still affordable with 4 room resale prices at around $359K. 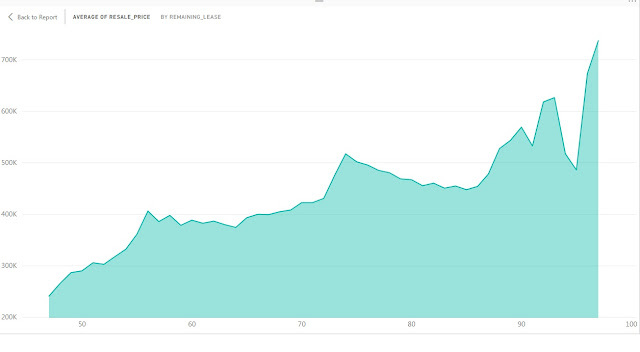 That's all for the visualisation of HDB resale prices in Singapore. I hope this post let's you have a glimpse of the HDB flat prices in Singapore. If you find that the housing prices are too expensive, you would be happy to know that there are several grants for HDB resale purchases. You can refer to my previous post here on the various grants for HDB resale purchases. *All data used in this post are HDB resale prices from 2015 to 2018 adapted from data.gov.sg. Two young adults, Kimberly and Johnathan starts out in their careers at the age of 25. Kimberly saves $20,000 a year and invests her money to earn only 4% investment returns while Jonathan saves $15,000 and invests his money to earn 7% investment return. Who will have higher net worth after 15 years? Surprisingly, it turns out that Kimberly would have higher net worth in 15 years at age 40 even though she achieved lower investment returns. How is this possible? 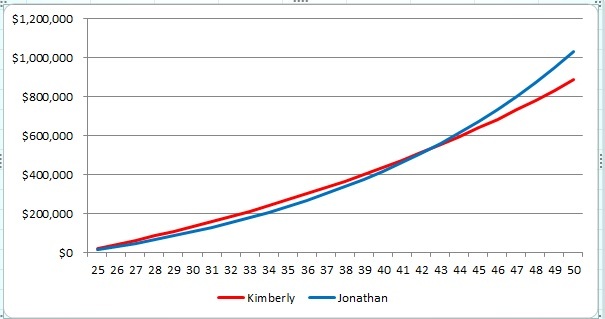 As we can see, because Kimberly saves an extra $5000 a year, she is ahead of Jonathan even though she only earns an investment return of 4% vs 7% which Jonathan earns. This shows that investment returns doesn't matter as much at the start of our lives or career. We should focus on saving more and earning more in order to save more. Much have been said about paper qualification and not to paper chase in the society. However, reality still hits us hard on the different income levels in Singapore especially those of the graduates and the non graduates. A recent article on the straits times said that fresh university graduates earned a higher starting pay last year, with some getting as much as $4,000 to $5,000 a month in areas such as business and computing. As compared to a non graduate, the startinf pay is only about $2200. MOM releases statistics on the different graduate starting salaries of those from ITE, Polytechnic and Universities. The latest I found is for the year 2016. Let's take a look at some of the different salaries for the different groups of graduates. There are certainly differences with starting salaries for different groups of graduates. It seems like the median income for ITE graduates is about $1600, for polytechnic graduates is about $2200 while for university graduates is about $3400. This is quite a lot of difference for those who are starting out in their career. Higher income will allow us to save more without compromising on the quality of life we still enjoy. Of course, there are people who are still not able to save even with higher income but that is another issue on its own. For young people, it is important to invest in our own education to get a better head start in life in terms of the income we earn. Many young people look to investment in stocks thinking it is the answer to a better life but more often than not, it is not the case at all. As seen by the examples of Kimberly and Jonathan earlier on, just saving $5000 more every year will allow us to do better in life even with a much lower investment return for 15 years. When will investment returns matter more? Having said that investment returns does not matter as much during our early days, it does not mean we should totally ignore investing in itself. Investment returns will matter more when we have accumulated a substantial sum of money through savings. 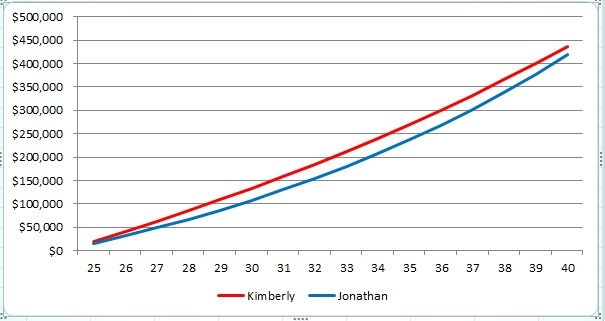 This time, Jonathan has surpassed Kimberly as he continues to invest and earns 7% investment returns. But do take note he only surpassed after about 17 years which is really a long time. If Johnathan saves more at the start, he would have been much better off earlier. Another thing to note is that investment returns are unpredictable. We can never be sure how much investment returns we can make but we can control more on how much money we can save. Increasing your savings rate can have a more massive direct impact on your net worth over the first 15 years. How does it sound to have unlimited 1.5% cashback on all your spending? There is no cap and no minimum spend required. This is very different from the other credit cards in the market which only gives you points or cashback for certain types of spending. There is often a minimum spend too to be eligible for the cashback. This is not the case for this new unlimited cashback card which was just launched last year. This card can also be used for public transport with automatic EZ-reload top up function. I have been using this card for about a year now and the cashback is always credited to my card on time every month automatically to offset my bill. The $100 voucher will only be given if you apply by clicking on the above image. Be sure to follow the instructions on the page to claim your free voucher. One more thing, the card has 2 years annual fee waiver so we don't have to worry about paying for the fees upfront. 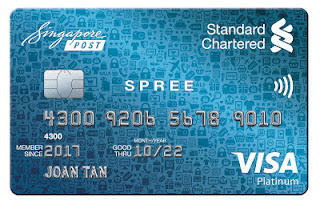 Another SCB card is the Standard Chartered Spree Card. This card seems to offer the highest cashback of 2% for all online spend and also all contactless and mobile payments. Its easy to find contactless payments now all around Singapore which shouldn't be hard to get the 2% cashback. Just use visa pay wave easily at many locations island wide. Sign up at this exclusive link to get your $100 Taka Vouchers and $120 cash back. Offer ends 31st march 2018. 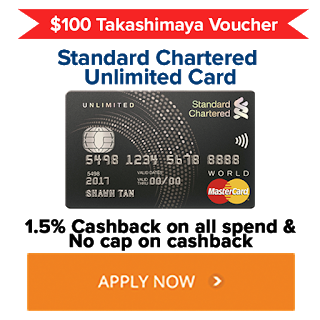 If the SCB cards does not suit your needs, OCBC cards are coming soon with the same $100 Takashimaya vouchers. The tax filing season is here again. All of us would have received an SMS from IRAS that we need to fill our tax by 15 April for paper filing and 18 April for e-filing. As our income goes up, tax can be quite a significant amount in the thousands. Just to give an example, a person whose take home pay is $3500 plus 3 months of bonus will end up paying $1425 in tax. We can actually reduce our tax by knowing the different reliefs which we may be eligible for. Let's explore the different reliefs in this article. You may not even know some of these reliefs existed. Those who have studied courses or part time diploma/university courses while working, you are actually able to claim course fee relief on the course fees you paid. The course fees claimable is the actual course fees incurred by yourself up to a maximum of $5500 each year regardless of the number of courses, seminars or conferences you have attended. You can claim only the portion of course fees which you paid. Any amount paid or reimbursed by your employer or any other organisation cannot be claimed. I have personally claimed this relief for my part time university studies before so I can ascertain that this is claimable. University course fees are definitely more than $5500 so just input this maximum amount for your claim. A popular tax relief is the CPF Cash top up relief. If you top up your own CPF Special Account or CPF retirement account in CASH, you are eligible for up to $7000 tax relief per year. An additional $7000 tax relief is applicable if you also top up your family member's CPF special/retirement account. For example, if John tops up $7000 cash to his CPF special/retirement account and also tops up another $7000 cash to his spouse or parents CPF special/retirement account, he will get a total of $14000 tax rebate for the year. A point to take note is there are income threshold for top up of CPF for spouse/siblings. To claim tax relief for cash top-ups for your spouse or siblings, the spouse or siblings must not have an annual income exceeding $4,000 in the year preceding the year of top-up. Annual income includes taxable income (e.g. trade, employment and rental), tax exempt income (e.g. bank interest, dividends and pension) and foreign-sourced income regardless of whether it has been remitted to Singapore. This income threshold does not apply to parents, grandparents, handicapped* spouse or handicapped* siblings. There are other limits which can be quite confusing to explain in this blog post. You can refer to IRAS page here for the detailed information. Anyway, you do not need to manually claim for this tax relief. The relief is granted automatically to those who are eligible based on records sent to IRAS by the CPF Board. If any of your parent is not working and is 55 years old and above in 2017 or is handicapped, you can claim tax relief also. If your parent is totally not working and does not have any form of income, you can claim $9000 per parent if they stay with you. If they do not stay with you, you can still claim this relief but it will be $5500. Do note that if they do not stay with you, you must have incurred $2,000 or more in supporting him/her in that year to be eligible for the relief. For handicapped parent, you can claim $14000 per dependant if he/she stays with you and $10000 if does not stay with you. You can also share this tax relief with your siblings or other family members for all the above relief. You can click here for more information on the Parent Relief / Handicapped Parent Relief. There you go, 3 tax reliefs which you may be able to claim if you meet any of the above criteria. There are also other tax relief such as NSmen relief and reliefs for donations made in 2017 but all these will be automatically calculated for us. You should see the relief under your tax assessment form. Its good to file our tax early and get it over and done with. Is 2018 The Year To Invest In Hospitality REITs? It is expected that the hospitality sector will recover in 2018 due to the lower supply of hotels in Singapore. Elsewhere in the world, the better economic outlook is also expected to improve tourism receipts which will benefit the hospitality sector also. The question is, on the back of all these positive sentiments, is there still opportunities to invest in the hospitality sector? I am always weary when we see a lot of good news for a particular sector because most of the time, the stocks would have already run up. This is the case for the hospitality sector currently where many brokerage houses and analyst are very bullish on this sector. I have invested in all the above hospitality trust except for OUE Htrust which I am not vested in. I have recently bought into Frasers Htrust as it is at fair value with stable and relatively high DPU at about 6.4%. Its hotels are also located strategically around the world so I believe they will benefit from the improved tourism moving forward. In its latest 1Q FY18 financial results, Frasers Htrust reported higher revenue for all countries except for its UK hotels. Another opportunity to invest in the hospitality sector is Far East Htrust. This is a stock I invested back in May last year at a lower price. But, at current price, I still believe it still has some good value for those who want to invest in it. 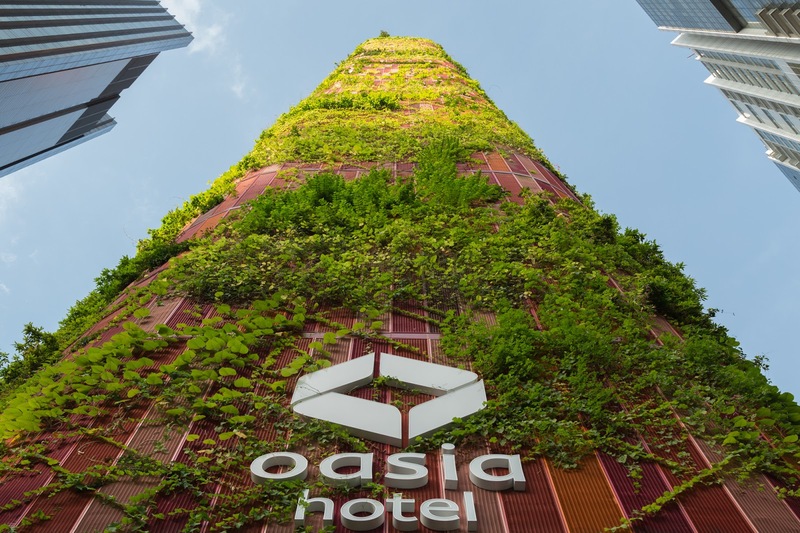 They have recently acquired Oasia Hotel Downtown which is strategically located in the heart of CBD just beside Tanjong Pagar MRT. This would have boosted DPU by 4% for 9MFY2017 results on a pro forma basis. Oasia Hotel has good reviews on Tripadvisor as well as Booking.com and its a choice of stay for travellers coming to Singapore. We should expect RevPAR to improve with the addition of this new hotel into their portfolio for FY2018 when its approved by the shareholders in March 2018. However, we have to note that their latest financial results didn't really show much improvements for their current portfolio. 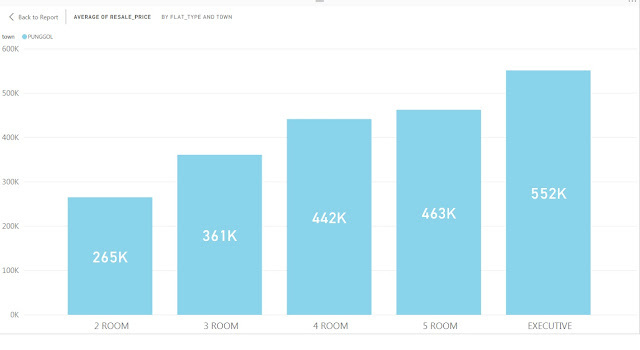 Their average occupancy for the hotel portfolio is only 85.4% and RevPAR declined 2.4% year on year to $132. 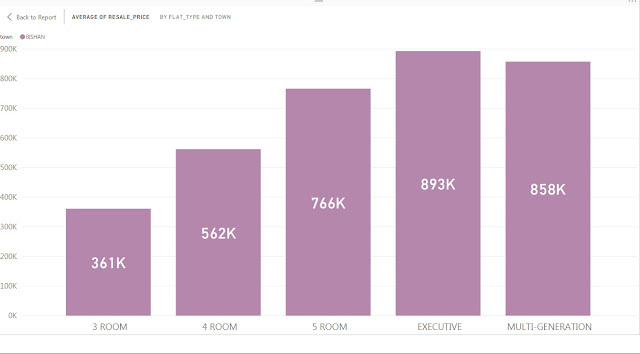 For the serviced residences, average occupancy is only at 78.2% and RevPAU decreased 5.5% to $166. I do not know clearly if its occupancy or RevPAR will improve in 2018 even though the general sentiment is that hotels should do well in 2018 onwards. Far East Htrust still gives good dividends at around 5.45% at the price of $0.715. It is trading at 0.8x PB which is still at a discount to its book value. All the other stocks in the hospitality sector are trading at much higher book value with CDL Htrust at 1.09x PB, Ascendas Htrust at 0.99x PB and OUE Htrust at 1.09x PB. If some of these hospitality stocks continue their decline due to the volatility of the market, I will consider accumulating some along the way.